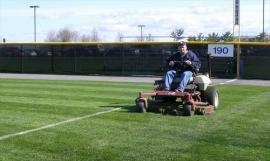 Sports Field Management – The latest best management practices for managing sports fields and resources for all who care for and use sports fields. The challenge for sports turf managers, atheletic directors, coaches and administrators is to provide safe, functional and aesthetically pleasing fields. Turfgrass Species and Variety Guidelines for NYS – Now available as .pdf. CUTT (Cornell University Turfgrass Times) Archives – Quarterly newsletters 1990 – 2011 bring you research summaries you can put to work in your turf management.